King Wong Photography focuses on travel and stock pictures of China — its people, landscape, architecture, scenic attractions and historical sites. All pictures are available as stock photos for commercial licensing, and as fine art prints for display. 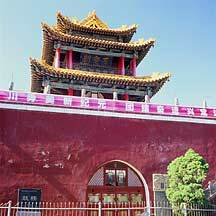 You will also find travel informations, travelogues, maps, local arts and crafts of the various destinations that the Chinese people had created and developed during their more than 5,000 years of China's civilization. The China pictures are drawn from an archive of 5,000 hi-res images that are continuously added on regularly. See list of locations and tourist spots that I had visited. The beautiful city of Suzhou, with its large network of canals and an easy-paced living style, is one of the most desirable places to live in. Since I started traveling in China back in 2001, I had never missed a visit here. I sat down for lunch at one of the food stalls along the 天子山Tianzishan mountains. The woman recommended that I tried one of these little wild chickens (or some sort of quail), call 野斑鸡. I can't be sure that it is wild, but its size won't fill me. On the stone steps I saw the more familar chickens running freely. So I asked for one of those. But unfortunately those goodies are reserved for themselves. 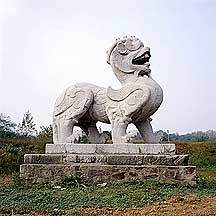 This is the bowgun found in the tombs of 马王堆Mawangdui. 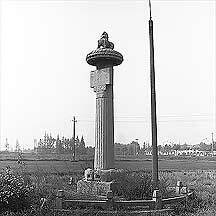 Mawangdui is a burial site in 长沙Changsha, the provincial capital of 湖南Hunan. 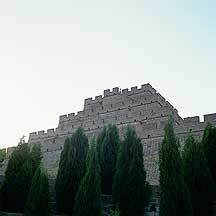 Three tombs from the 西汉朝Western Han dynasty (206 BCE - 8 BCE) were unearthed in 1972, and most of its artifacts are now housed in the 省博物馆Hunan Provincial Museum. Among some 3000 priceless objects is this 2100-year-old Han weapon. It is a modular design made of three components: The wood gunbody, the casted three-piece metal trigger (which is inserted into the gunhandle), and the bow (which attaches in the front of the gunbody). Candle lighting at the 凤凰城Feng Huang's Old Town. The old woman sold paper pedals with candles for one yuan each. I brought a green and a red one, and threw them on the river, but the pair never seem to be able to go far. People push the water to move them outward, but you really need a boat. Check your bags — or baskets. The 土Tu people carry baskets to hold their goods. 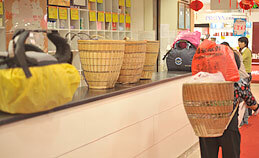 Here at a supermarket in 张家界Zhangjiajie, the baskets are checked at the counter. These beautiful 苗Miao ladies with their exquisite silver headdresses and necklaces generously pose for me atop the 天子山Tianzhi Mountains. 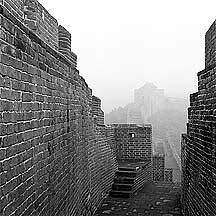 Thieves, bats, chilly winds — an overnight stay at the 司马台长城Simatai Great Wall. I will tell you all about it later. Local Arts and Crafts:Everywhere one travels there are local products that one can take home to remember. 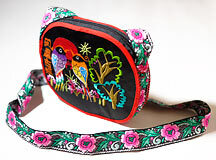 This intricate and entirely hand-sewn bag is from the old town of 凤凰城Feng Huang. Capital of China. Beijing is easy to travel, and its long history guarantees a host of architectual wonders for picture taking and sight-seeing. 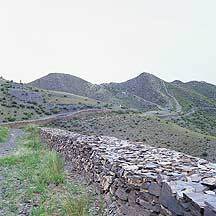 Pictures of the 万里长城Great Wall from the shining 渤海Bohai sea to the eastern sharp mountains and green hills to the loess highlands of central China to the desolate Gobi desert west — 山海关Shanhaiguan (Shanhai Pass) to 古北口Gubeikou to 镇北台Zhenbeitai Tower to 嘉峪关Jiayuguan (Jiayu Pass). 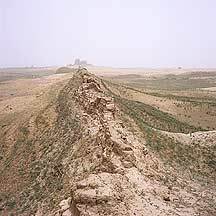 The Great Wall drew a defensive line across most of China's northern border, separating the central plains from the steppe north. Home of two great mountains of China - 黄山Huangshan ( Yellow Mountain ) and 九华山Jiuhuashan, two very popular travel destinations. 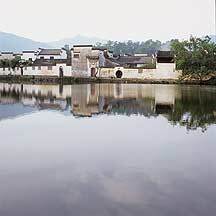 The southern region are also known for its numerous well-preserved villages that date back more than 400 years ago. 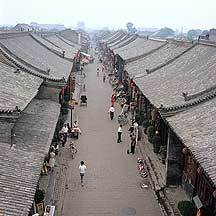 These picturesque villages are very popular with Chinese artists and photographers. 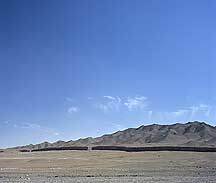 The mostly loess region is sandwiched by ice-capped mountains on the south and the Gobi desert on the north. 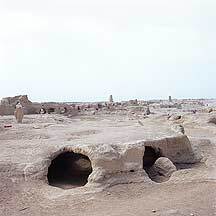 It was the most accessible passage used by the fabled 丝绸之路Silk Road camel carnivans to exit the eastern region of China. 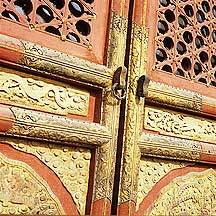 To travel through this great corridor today is as difficult as it was during the Silk Route Era. But to be here and take pictures of its stunning Martian landscape is incomparable. 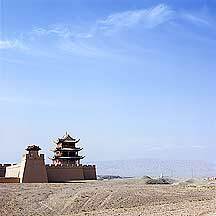 Located on northeast China, Hebei's north is a buffer region with its many strategic sections of the Great Wall. To travel through this mountainous region can be a feat. 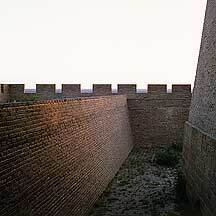 Nonetheless, people flock here to its Great Wall travel destinations. Home of 武当山Wudang Mountains, source of China's great 功夫Gongfu tradition, and one of the great travel destinations of China. 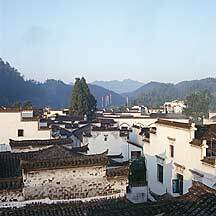 Famous for its spicy cruisine, but 湖南Hunan has much more to offer to travelers, photographers, and history enthusiasts: from its spectacular mountain landscapes with its singular peaks, to its getaway classical water towns and unique ethnic cultures, to its thousand-year-old university where great philosophers lectured and rising intellectuals and revolutionaries were nurtured. Both the 长江Changjiang ( Yangzi River ) and the 运河Great Canal flow to this region, making this region a very trafficked area. Together with the great 太湖Taihu lake and many smaller lakes, this region is the ideal host of some of the most beautiful water towns of China. A fun travel destination for those who enjoy seafood, boat rides and pictures of locals. 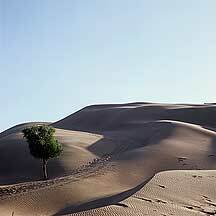 Deserts and grasslands coexist in this wide northern plain of China. You can hire a horse and travel to its horizon where the endless flat plain crashes with the clouds. Or you can just sit on its sand dunes and take pictures of camels next to the setting sun. 黄河Huanghe ( Yellow River ) makes a quick pass through this dry region where most of China's 回族Hui ethnic group lives. 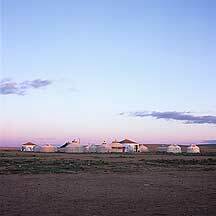 On its north it is surrounded by the 贺兰山Helan Mountains and the 大漠Gobi Desert; on its south more mountains and the loess highlands. 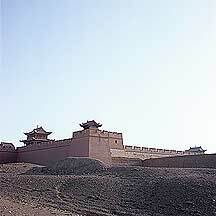 The 万里长城Great Wall runs along its strategic north borders along the edges of mountains and deserts. 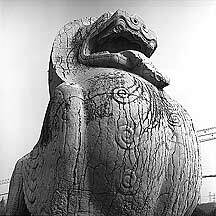 When you travel here you will be entering a very secluded region, where the rise and fall of the 西夏国Xixia Kingdom reached mythic proportion. 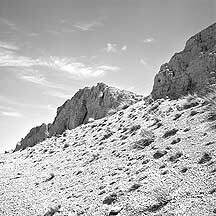 The loess land of China. 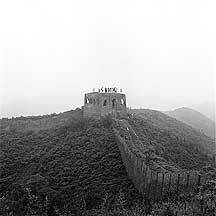 China's first emperor built the first empire here, and he also started the endless Great Wall building project. When you travel through this sandy region the emperor's presence can still be felt, especially while you take pictures of his clay army looking back at you. But don't worry, there are more tourists there than the army can handle. 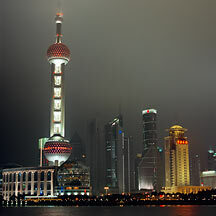 Today, the financial center of China as well as one of its cultural centers. Fashion lovers, misfits, intelectuals, dreamers, refugees, outcasts, and outlaws alike rush to Shanghai for its haven and riches. If you are bored of flying, you may just board a ship up or down or across the Pacific Ocean and get off on its international seaport, which also happens to be the gateway to the great 长江Changjiang River (Yangzi River). You come to Shanghai not for any historical attractions, but rather for the city itself — its interactions of all things good and bad that generate very saleable gossips. 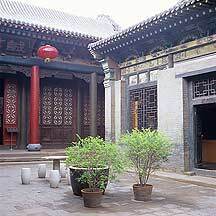 Of all the places in China, this luckless region was the home of the wealthiest merchants and the origin of China's great banking institutions. Because of their wealth, splendid compounds, mansions and manors scattered in the whole region, and these has been on many people's list of travel destinations. 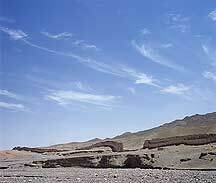 The largest and westernmost region of China, composes mostly of deserts. 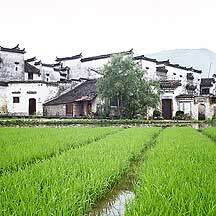 This hot land is the home of 维吾尔Uygur ethnic people. 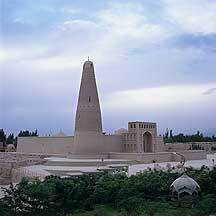 Ancient mosques, ruins and unusual mountains dotted this sparse region. Travel in this desert land can be slow but its distinctive culture and otherworldly landscape provide many picture opportunities. Other than my travel stock pictures, I also put together some of my other works and interests. In this section are my some other photographic interests, my artworks, my writings (which includes mostly travel travelogues, short notes, and translations), and my collection of craft works gathered from my travels in China. 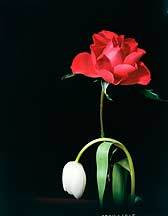 I did some video works during my return to China in 2004 and 2006. I split the section into destination video and art video. Destination video includes my short clips of tourist attractions. Art video includes short clips that are more art related, and mostly has little practical value to tourists. As of now I have nothing on sound. Some writings: travelogues on places that was interesting or had amusing events; notes and observations while traveling; peoms that I had translated; short backgrounds on some well-known figures that I admire; and some Chinese History. This section is for poems I enjoy. They are my translations, and I do them when I have the free time. See more translated Chinese poems. Bright flowers, shaded willows, gloom all over the sky, To the end of the city wall and up the tower. Should I ask: "Oh! Lonely goose -- where are you heading to?" Don't know what the future holds for me -- still fluttering. 1. 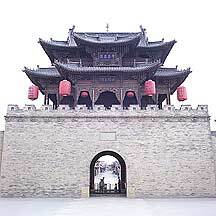 夕阳楼Xiyang Tower (Sunset Tower): 位於河南郑州市，但现在不存在。Located in Zhengzhou city of Henan Province, but no longer exist. 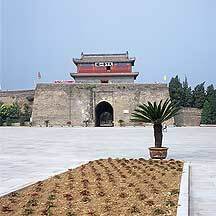 One of the most well-known towers during the Tang and Song dynasties. 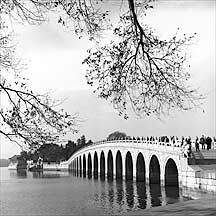 It survived to the Qing dynasty. The poet wrote this short poem at some time during the Autumn of the ninth year of 大和Dahe reign (835), when he was in his early twenties. He was then an aide to an admiring official in Zhengzhou city. 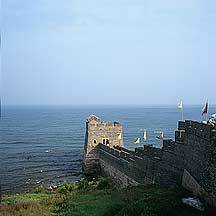 The tower was located within the outter city wall. 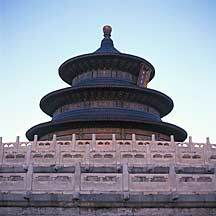 China Tours:China small group tours, private China tours and tailor-made tours offered by TravelChinaGuide with 24/7 Service.